It’s becoming more and more difficult to find food in Cameroon’s Far North region, residents say, not only because the annual lean season is underway, but insecurity caused by Boko Haram has severely disrupted farming and cross-border trade. As many as 180,000 people in the region could be at risk of an acute food crisis this year, aid agencies and local authorities warn. The malnutrition rate among children under five, which has been above the World Health Organization’s emergency threshold of 15 percent since January, continues to deteriorate, according to the World Food Programme (WFP). “Most of us have gone out of business and work for a while now,” said 34-year-old Bairu Habiba, a mother of four who was forced to flee her home in August 2014 when Boko Haram attacks intensified in the area. Habiba said that her family used to consume an average of three kilograms of rice per day, along with some vegetables and meat. Now, they limit themselves to just one kilogram per day. Sometimes, if they are lucky enough to receive supplies from the government or another agency, Habiba will prepare two kilograms of rice. More than 70 percent of farmers in Cameroon’s Far North have deserted their fields since last year and many more missed out on key farming activities, such as timely seeding, during the last planting season, according to Cameroon’s Ministry of Agriculture and Rural Development (MINADER). The most affected departments are Mayo-Sava, Mayo-Tsanaga, and Logone and Chari. Additionally, Nigerian refugees now occupy more than 200 hectares of land that was originally used by locals for farming. As a result, the production of cereal crops, such as sorghum, millet, cowpea and rice, dropped by more than 50 percent last year, according to MINADER. Only 132,000 tonnes of cereals were produced in 2014, which is far below the region’s estimated annual need of 770,000 tonnes. This has left market shelves bare and many families without sufficient stocks of harvested crops. More than 70 percent of farmers in the Far North have deserted their fields since last year. In those areas where food is still available, the prices have increased, making it difficult for many people, especially those now out of work, to afford. In Mayo-Sava, for example, a bag of rice now costs around $50 as compared to $40 this time last year. The price per kilogram of corn and millet has increased from $0.80 to $1.00. Even during times of peace, Northern Cameroon is an area that is plagued by water shortages and a harsh climate. An estimated 25 to 30 percent of the land is barren. The region sees no rainfall for at least nine months of the year and temperatures often reach above 45 degrees Celsius, making it difficult to keep crops watered and for farmers to work under the scorching sun. “The secret to fighting hunger in northern Cameroon is the mastery of the underground water sources,” Mustapha Bakari, a farmer in Cameroon’s Far North region told IRIN, explaining that by May, most of the wells have dried up and it is necessary to create makeshift irrigation systems by digging boreholes. But the cost of digging of 15-meter-deep boreholes, installing pipe systems and a water pump, has doubled within the past few months, locals say, from $300 to $600, because of the difficulty in doing cross-border trade due to Boko Haram. To make the most of scarce water, Bakari said he often must wait until the sun begins to set in the evening to irrigate his vegetable fields. But this brings added risks, as moving about after dusk is no longer safe. Women and children, who represent 84 percent of internally displaced people (IDPs) and 75 percent of refugees in the Far North, will face a particularly “grueling lean season” this year, according to the WFP. Many women have lost their husbands and have been forced to take over as head of household. Women’s vulnerability in these communities is aggravated by cultural and social practices, which dictate that women do more physical work than men, sometimes walking for hours at a time just to find wood and water. Malnutrition rates among IDPs and host communities vary, but many are above 15 percent, especially along the border with Nigeria. At the Gadala Health Centre, the medical supervisor, Zra Mokol, explained that they receive at least 10 cases of illnesses related to malnutrition from the communities each week, the majority of which are internally displaced women and children. “Additionally, because of the scarcity of food, many women give up their own rations so that their children…can eat enough,” Mokol told IRIN. 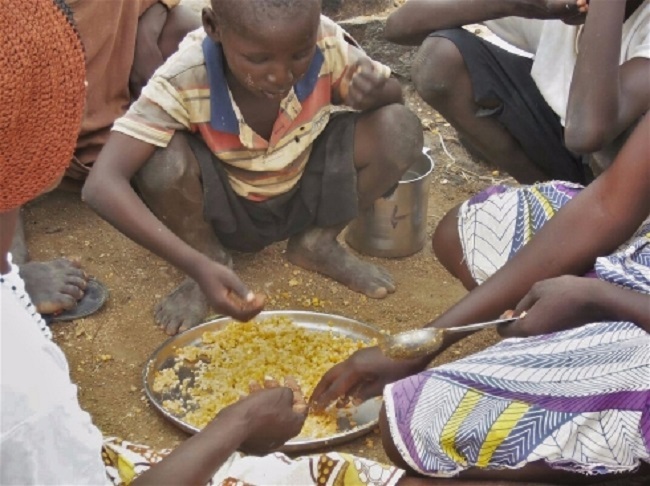 But even with their mother’s rations, WFP says that at least 19 percent of children in the Minawao refugee camp are suffering from malnutrition. Almost 400 children at the camp have been admitted to supplementary feeding programmes this year, camp officials say. According to the latest data, 104 of these cases were brought to the health clinic during the last week of April and 43 during the first week of May. A number of local, international and governmental agencies have been trying to bring food aid to the region, but insecurity makes it dangerous and difficult to reach the most vulnerable. Funding shortages at the WFP have meant that IDPs and host communities in Cameroon did not receive food aid for nearly six months. Distributions resumed in mid-April, but benefited just a quarter of the IDPs and offered reduced, 15-day rations. WFP estimates that it will need around $40 million to reach an estimated 225,000 affected people this year, including Nigerian refugees, IDPs and host community members, but says that its appeal is just 20 percent funded. As such, it can only support current activities through June. To help feed communities in the Far North, the government has asked people throughout the rest of the country to donate food and money. Since February, they have received more than $1.3 million and several tonnes of rice, corn, vegetable oil and sardines. The supplies have been distributed to both families affected by the conflict and the army, government officials say. But as the number of Cameroonians who are forced to flee their homes and the number of newly-arrived refugees continues to rise, more will be needed.